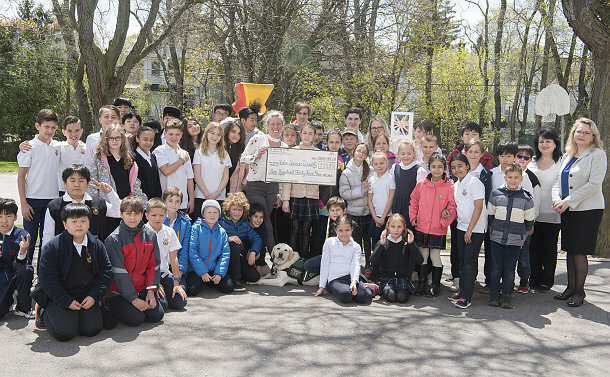 For the past four years, The Prestige School students have been fundraising for organizations that support and work with dogs. This year, it’s Dandy’s turn. Victim Services Toronto’s new trauma dog provides support and comfort to the organization’s clients. A cheque for $935.85 was handed over to Dandy’s trainer, Meagan Phelps, on behalf of the 180 students and staff. They money was raised from the sale of wrist bands made by the students and a bake sale. Dandy, a yellow Labrador, was purchased in November 2014, at age nine.